Before the War he had been a Lieutenant in Company D of the 74th New York State Militia, at Buffalo, NY. He was appointed Captain, Company D as his men mustered into Federal service as part of the 21st NY Infantry in May 1861. He left that unit to accept a commission as Lieutenant Colonel in the 49th Infantry on 18 September 1861 as the Regiment was being organized in Buffalo. He led the 49th at Antietam in the absence of Colonel Bidwell. He was wounded there on 17 September and relieved in command by Major Johnson. He was discharged on disability on 10 December 1862, but later served in the Veteran Reserve Corps. He worked on railroads to 1885, then moved to Oakland, CA and was a civil engineer. He moved to San Francisco in 1904. Service details here from Phisterer1. 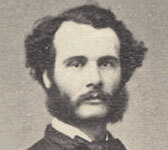 His photograph from a standing portrait in the collection of the NY State Military Museum, found through the New York Heritage website. His gravesite is on Findagrave.